Before you fell pregnant, the dog was your ‘baby’. So what do you do when baby makes four? 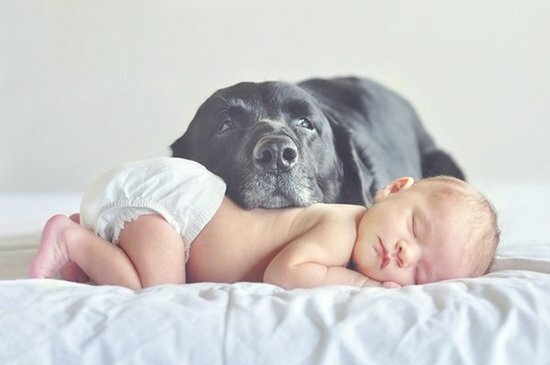 With a baby in the picture, your dog will go from being the only child to the bottom of the pack. That’s a tough break for a dog because they want to be the centre of your world. To help your dog get used to the new addition, you’ll need to teach him/her that your baby is higher in the pack. Follow these tips to showing who is boss. ACT LIKE A LEADER: Over the nine months of your pregnancy, sort out your own relationship with your dog. Make sure your dog knows you are the leader of the pack in a calm, assertive way. MAKE THE NURSERY OFF LIMITS: Teach your dog that there’s an invisible line into the nursery that he/she must not cross without your permission. Before the baby arrives, give your dog short periods where, under your supervision, you invite him/her in to sniff certain things before sending them out. Do this a few times and your dog will get the message that this room is not theirs to own – it belongs to a pack leader so they must be respectful. WHAT’S MINE IS NOT YOURS: Once the baby is born, take some clothing he/ she has worn and let your dog sniff it from a distance while you’re holding it. What you’re saying to the dog is, ‘This belongs to me and you will need to follow my rules when around it.’ This starts the process of creating respect. 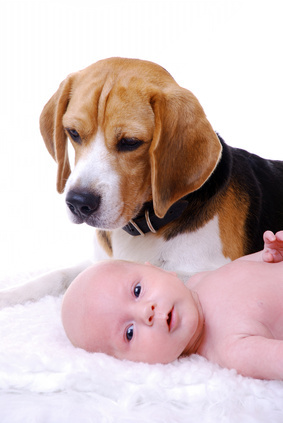 BRINGING BABY HOME: Make sure your dog is calm and submissive before you introduce him/her to the baby. Be sure to hold the baby above the dog’s height to establish pack order. Don’t bring your dog close on the first meeting. By gradually allowing your dog to get closer you’re teaching respect.